Draco has different ideas about the future for his daughter. Poor guy, he has no idea. It’s okay, Draco… at least you’re trying to be a good parent here. I’ll lock it in, but I won’t make any promises… why? I’m still not sure who she looks like. She has some similarities with Draco, but also reminds me of her grandma Artemis, too. Then again, I see some pudding from Noémi in there… it’s so confusing. Of course, Draco is the only family member she has any relationship with. Aludra and Phoebe don’t argue or anything, but they also don’t make it a point to converse, either. Tensions between Noémi and Aludra haven’t eased any. 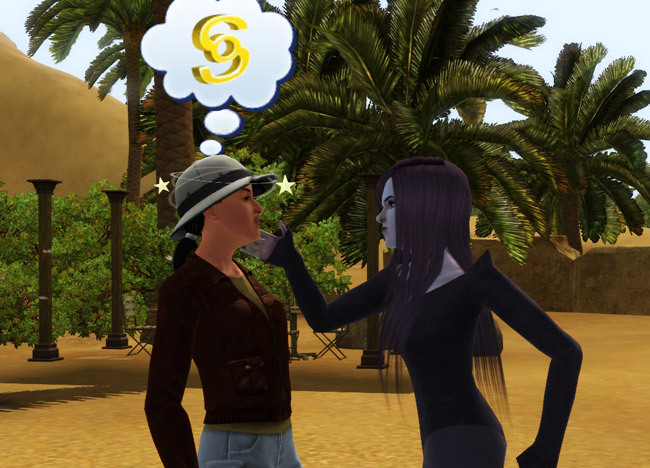 Noémi makes it a point to constantly harass poor Aludra about being Grumpy! That’s probably not such a wise move, Noémi… she’ll be able to make you pay soon enough. She’s not one to forget a wrong. All these two do is argue anytime they are left in a room together. I’m trying to keep them from becoming enemies, but it’s hard! Especially now that Aludra is throwing blows, too. 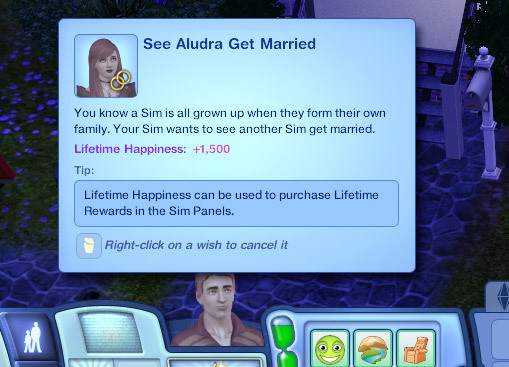 Oh, ouch… low blow, Aludra! Why don’t you, um, stop before you say something really bad? 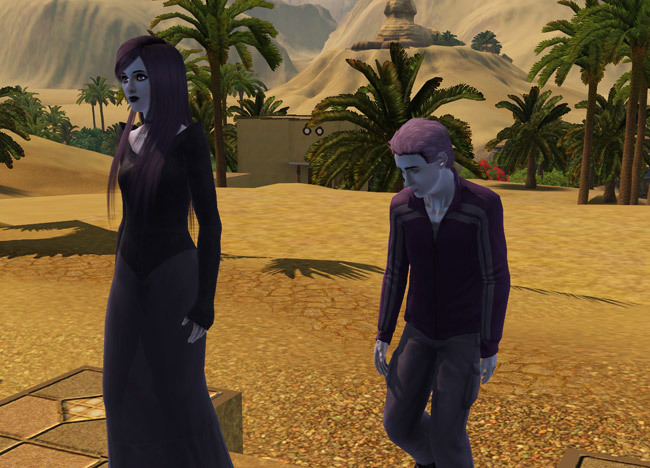 I ship Draco off to Egypt to work on his level 3 visa and Aludra tags along, hoping to find a suitable mate. Shhhh! Don’t you have some tombs to explore?! Shoo! In the three days that they’re in Egypt, Aludra fails to make any friends… instead, she makes enemies. From randomly slapping this adventurer to insulting the locals, Aludra isn’t having a good time in Egypt. Okay, okay, sheesh… you’re an evil, spoiled brat. What are you doing to that computer? I thought you were still supposed to be looking for a mate! Sigh. You really want to go to China, don’t you? Most of your ancestors have picked up their spouses in France! Noémi, why are you running? You’re supposed to be working… and why is there a cop car parked… aw crap. Noémi got busted. It’s been a long time since I’ve had this happen to a sim that I’d almost forgotten about it. I hate how there’s no cuffing animation, though. They just pop into the car (in the front seat, no less) and then go off to jail! I want some police brutality or something. Draco, ever the bastion of concern, plays in the sprinklers while his wife rots away in a jail cell. Do you even know she’s there? Sigh. As you were, then. Sigh. We need someone to paint a portrait, but really, that’s not the way to go about it! Aludra continues to try her seductive technique while Bao’s roommate, Manchu, phones up a friend. Yep, just lost any chance this blog ever had at a PG rating with that one. Oh, like always, it’s great update. I like the way you described their traits as it is. She’s pretty and cute but looks evil. Ooh, no! Commitment issues! If they felt uncomfortable a little, they might wish to break up with their partner. I had seen that in the game. I hope she will give you a purple heir/heiress soon. 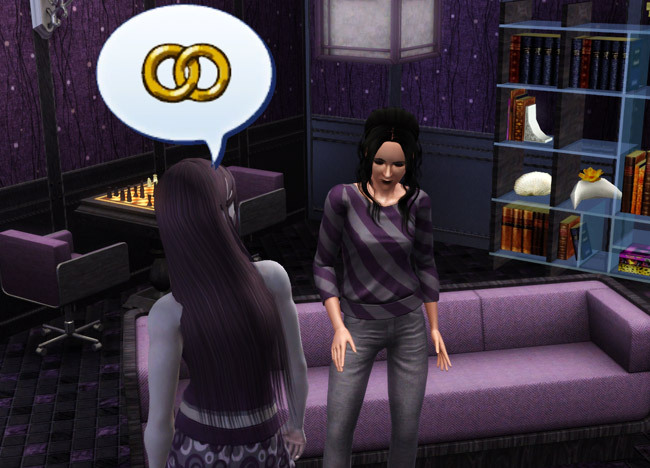 My sims in TS3, so far, haven’t been as frustratingly obstinate as my TS2 ones… so at least I have that. I feel pretty bad for Draco, too! Poor guy just goes outside and plays in the sprinklers to hide from Noémi. They’re both elders now… and still the blonde chick wishes refuse to go away, haha. I’ve never played a Commitment-Issues sim extensively, so I’m curious to see what happens! It’s nice to know that she’ll at least feel uncomfortable in a steady relationship. Aw, how lame that they don’t get handcuffed! 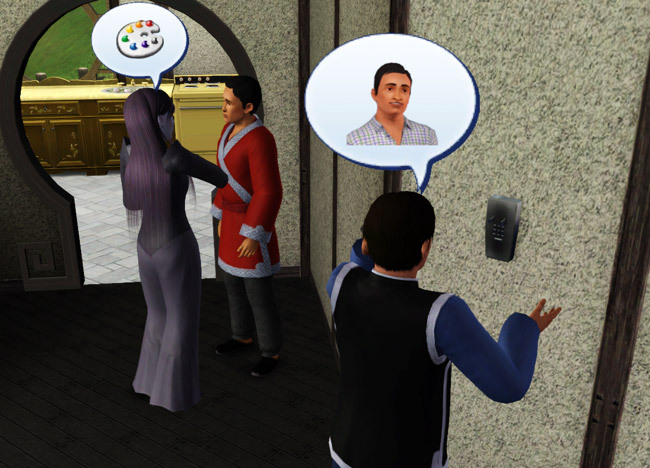 They could have just stolen the TS2 cuffing animations like they did for half of the other stuff in game and they were too lazy to even do that! Man, I can’t believe Draco still rolls up Blonde Chick wants. You robbed him of his one true love, Mao! I haven’t heard of the instant elder bug! I’ve heard of instant toddler but frankly, I don’t mind that because who cares about those little pillbugs anyway? But I do love that Aludra killed Manchu with woohoo. That’s pretty awesome! And check her out taking on the Grim Reaper! 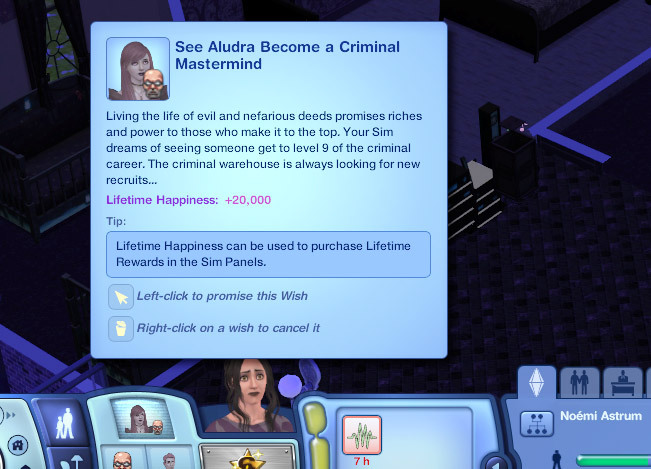 No one is more evil than Aludra! And wow…are you sure Bao doesn’t have the stone-hearted benefit too? It seems like he’s got a little evil going on himself there! He looks majorly creepy in that last pic! I know! I was so disappointed… who runs to the cop car when they are arrested? Shouldn’t they run away? Haha, he won’t let me forget it, either! The elder bug has been around since the original game. My husband had it happen within just a few days of playing for the first time! It happens when you move someone in. They turn instantly to elder (even if they were JUST a YA a second ago) and then die. It’s really, really weird. Aludra is srs bsns and Bao freaks me out a little. I don’t even know what to begin to think about him.